MyBayCity.com TEAR DOWN LIBERTY BRIDGE? 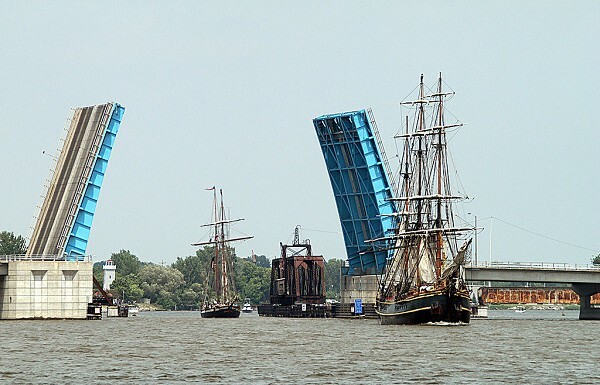 Crowds cheer as Tall Ships slip through Bay City's Liberty Bridge in 2010 celebration. Among the most idiotic proposals floating around City Hall is one that would tear down Liberty Bridge. This idea has yet to be visited by the public to any degree, but hopefully, this column will awaken the thinking folks of our town to its madness. As I recall, the local populace wrangled for nearly 20 years over two-lane vs. four-lane and finally was convinced by the state of the wisdom of a four-lane span. Liberty has served us well and the economies of Midland Street and east side downtown have thrived as never before. Thankfully, it seems the foolishness of privatizing the bridges, having a company charge tolls, has subsided. The final nail in the coffin of that silly plan may have been when the firm proposing it was involved in building a pedestrian bridge in Florida that collapsed during construction. Thankfully, public opinion has arisen to drive a modicum of sense into the chambers at City Hall. We have yet to see the details of the "tear down Liberty Bridge" idea, but there are rumors they have been actually put down on paper as a possibility. Just as city growth appears to be reaching critical mass, just as downtown living gains in popularity and Bay City's downtown is the envy of mid-Michigan, along comes a plan that would reverse all that and take us back to the Stone Age.